Match-3 puzzle games are hot for all ages—simple and easy to learn and play. They are good for fun and entertainment, but sometimes can be addictive when players are challenging themselves for higher scores or better results. Mobile devices make these games interesting by introducing variety: you can match 3 jewels, 3 coins, 3 colors or any other three objects in a row, horizontally or vertically, by swapping or firing them. Match-3 games were made popular with a few commercial products launched way back when. The good news is that now there are many free game apps available for download or playing online. Today we chose a game called Alchemy Master, so keep on reading and find out what the game is all about. 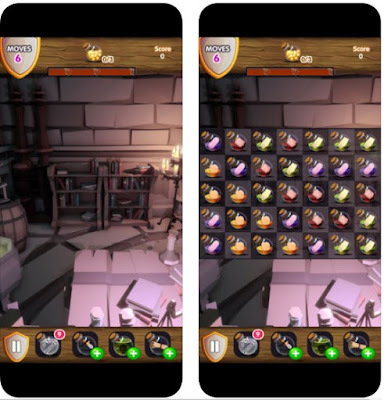 Alchemy Master is an awesome match 3 alchemy game for both Android and iOS users who are looking for something fresh and innovative to play on their devices. This cross-platform puzzle game is designed with stunning visuals, fun and insanely addictive gameplay, and tons of other features that will test your thinking skills and challenge you to the fullest. Although the gameplay of Alchemy Master is simple-to-play, it is very hard to master. This means you will have to showcase your best and smartest moves, you will have to think quick! All you have to do is swap the potions on the board to match them and to win higher scores. Match at least 3 potions in a row, complete the quest and win the level. The game has over 300 challenging levels, all of them designed in a beautiful way. Aside the levels, it offers various game modes (Target Score, Timed Levels, Collect Drinks, Dirty Sugar Crush, Sugar Bomb, Jelly Cage) and cool power-ups and boosters (Sweet Blast, Jelly Boost, Juice Splash, Candy Swipe, and Sweet Crush Shovel) that you will get if you match more potions. Do you have what it takes to become the greatest alchemist in the world? Download Alchemy Master for free from Google Play or from the App Store, share your scores with friends and compete with them to make it even more fun!